Nothing complements the greenery and flowers of a garden like natural stone. Its contrasting textures and colors add interest while still blending with the environment. And unlike manmade products, it can last hundreds of years. 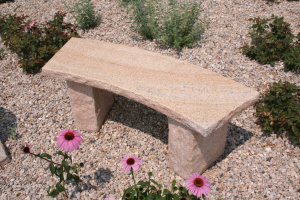 The possibilities for using stones in a garden vary as much as the stones themselves. Here are a few popular ideas, most of them simple to implement. Natural lightweight pumice landscaping stone. Photo courtesy of Featherock, Inc. Stepping stones lead the eye and the foot to your front entrance, or along a meandering journey through your garden. Flagstone, sandstone, and quartzite naturally break into plate-like pieces that work well for laying a path. You can use stones milled to be thin and flat to give a more formal look, or unmilled stones that are somewhat flat on the top and bottom. Place them around the borders of a planting group to define it and add visual interest. 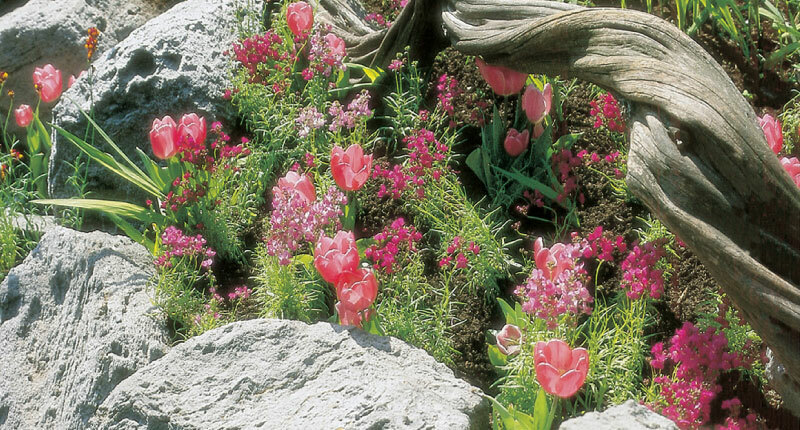 Make sure plants near the stones can be cut back hard so that they don’t overgrow and obscure the border, advised Pat Sagui, the author of Landscaping with Stone. Boulders make great statement pieces in a garden, and if they’re locally sourced, they echo the geography of the area where you live. 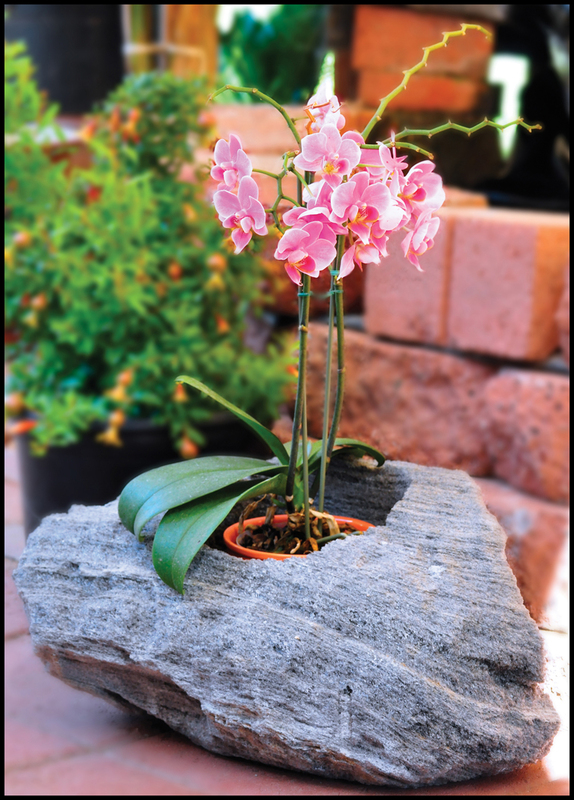 “Large statement pieces are very trendy,” said Olivia Nicholson, sales and marketing manager of Featherock, a nationwide distributor of pumice stone. For inspiration, visit a Japanese garden or look at pictures—the Japanese are masters of stone. Be sure to have your garden planned before installing a heavy boulder that will be virtually impossible to move, unless you use naturally light pumice stone. Giallo Fantasia Y granite. 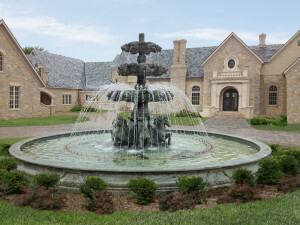 Photo courtesy of Carved Stone Creations, Inc.
Fountains are a classic use for stone. “Combining stone and water is as old as civilization,” Sagui said. The best stone to use for fountains is granite, said Wess Ripley, vice president of Carved Stone Creations, a nationwide stone supplier in Kaukauna, WI. Even in a warm climate, granite works best because you can acid wash it to remove calcium or lime buildup. If you try that with a more porous material, “it will dissolve it like an Alka Seltzer,” said Ripley, who gets dozens of calls every year from people whose fountains have cracked or eroded. Stone benches are also popular, and again, Ripley recommends granite, though basalt is another option. Its earthy color goes well with log-cabin-style homes or Japanese gardens. Statues add interest to a garden and can also double as a fountain—for example, you can drill a hole into a jug held by a stone figure. For a small amount of water like this, you don’t need a pool to collect it, just a pump below a bed of gravel to recirculate it. If your property doesn’t have a stream but you wish it did, consider laying stones to form a “dry stream bed” that mimics a seasonal creek. Alternatively, if you have an annoying seasonal wet spot in your garden, you can create a stone “bridge” over it. “It solves a traffic problem, yet it’s integrated into the landscape,” Sagui said. 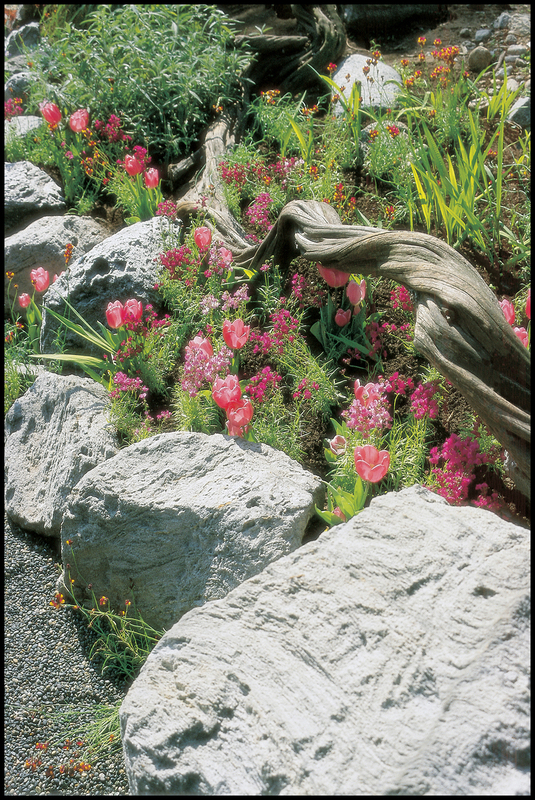 A stone retaining wall is a gracious and beautiful way to prevent erosion on a hillside. For the do-it-yourselfer, there are many resources available online, including this detailed article and video from Dengarden. The wall should be carefully planned. You need to angle it toward the slope at least two inches for each foot of height. If you plan to build a wall over three feet high, calling a professional is probably a good idea, Sagui said. Before building a wall, you need to know your soil type. If you have wet soil and live in an area that gets hard frost, you may need to dig four feet below the frost line to set the foundation. If you live in a warm, dry climate, you may not need to go underground at all, depending on the height of the wall and the weight of the stone. Though building a wall without mortar may seem counter intuitive in the 21st century, it’s the way to go with stone. Mortar is inflexible and cracks in winter weather, impacting stability, Sagui said. In contrast, simple stacked stone walls can last for centuries. Verde Oliva marble. Photo courtesy of Carved Stone Creations, Inc. Selecting stones for landscaping is an aesthetic decision. 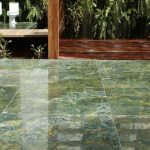 Many people choose native stone to blend with the surrounding environment. Locally-sourced stone is also more budget-friendly, since stone is heavy and expensive to ship. You can choose colors and textures that harmonize or contrast with your plants and home, but make it a conscious decision. Red and brown rocks add warmth to a garden, while white marble chips help brighten a shady area. Dark stones make a powerful statement. 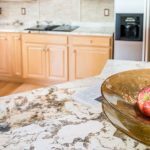 Natural stone offers a great variety in color and texture. 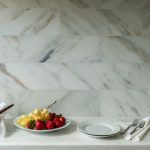 Whether you’re going for a classic, ultra-modern, or funky look, natural stone can express it with a verve and style all its own.